How to find a lost pet with Facebook ? Facebook ads let you target people in your neighbourhood and tell them that your cat or dog is missing. So you've lost your dog or you cat hasn't come home since a few days, what can you do ? I mean, besides, flyers, local ads, the local police, post a picture of your pet on your Facebook page and ask your friends to share. 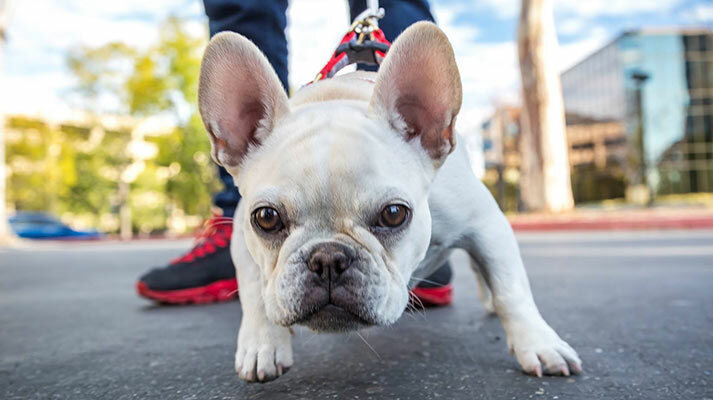 Those of your friends who live in your neighbourhood will be happy to share your post, but who many of the people on Facebook who will see your post will actually be able to help you find your pet ? What are the ods that a Facebook friend living anywhere on earth tells you that they found your pet, really ? What you want is your post about your missing pet showing up on the Facebook newsfeed of people living in your neighbourgood. If any body has seen your pet, it's them, right ? But most likely, you are not friend on Facebook with everybody in your neighbourhood, so what can you do display your pet's picture on their Facebook newsfeed without them being your friend ? Well, think...how do advertisers manage to show their products on your Facebook newsfeed even though they are not friends with you nor have you liked their Facebook page ? With a Facebook Ad, you can sho any post you want to a group of people living in your surrounding, or city (as long as your post is approved by Facebook editorial team of course). You do not have to be a company to use Facebook Ads and trust me, I've done this before: telling your neighbours and people in your surroundings that your pet is missing through their Facebook newsfeed is the most effective way to find it back. You would not believe how people that you don't know or that don't you are keen to share posts about missing pets to spread the news. So, in a couple of days and depending on wether you live in a small town or a big city, hundreds or thousands of people living near you will know that your pet is missing and will share this. And hopefully, one of them has seen your cat and contact you immediately. Facebook ads are not free: Facebook charges a couple of euros or dollars per day to let you display your post on other people's newsfeed, but it's not so expensive, really. For exemple, here in Belgium, it costs like 15 euros to display a Facebook ad for 3 days, in a targeted area. It's a small country, but you would have to live in a very crowded area to spend much more. There is no doubt that it will cost more if you live in New-York or London because your ad will be seen by more people, but that's what you want, right ? You want as many of your neighbours or people living in your area to see that ad. 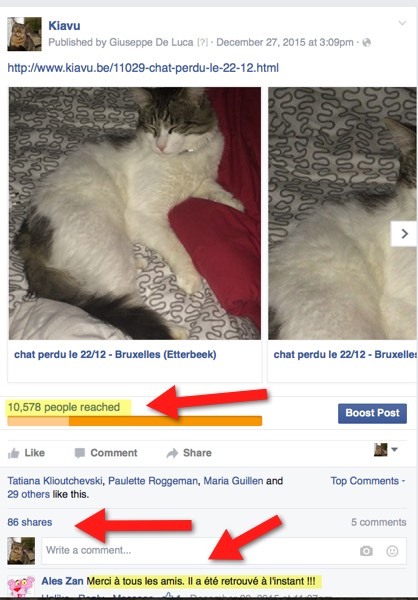 So what can you expect from a Facebook ad about your missing pet ? This screenshot shows a report of a recent post on our Facebook page, that was also displayed through Facebook ads. And even though the post was targeting a small area in Brussels, dozens of people saw it and many of those reacted. And see the last comment ? That's the post author saying "thank you so much everybody, the cat is back!" Is that a great story or what ? So, how can I use this Facebook ads feature to tell my neighbours that my dog or my cat is missing ? Well, that's the tricky part: to be able to boost a post and target it to specific audiences or locations, you need to create a Facebook for business page. And you probably don't want to go into all that trouble for a one time thing. We usually do this for people here in Belgium requesting it, because our Facebook page is alreay a Facebook for business page and any post on it can be boosted. They choose how many days they want their post to appear in target audiences newsfeed, pay 5 €s / day on our paypal account and we set it up for them. By the way, this is a lost and found website for missing animals in Belgium. Nevertheless, if you don't live in Belgium and your pet is missing and you're desperate, and you would like to try this option, I'll be happy to help you with that. Feel free to leave a comment on this page and we will figure that out.